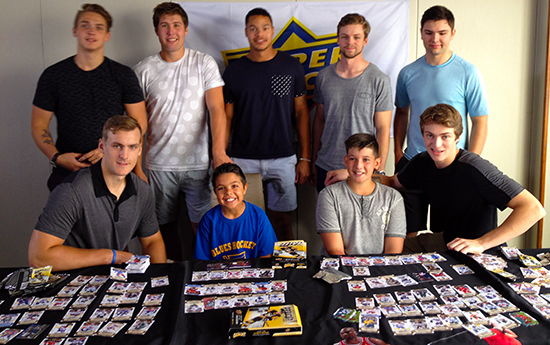 Upper Deck Surprises Kids at the NHLPA Rookie Showcase by Bringing in Top Rookies to Open NHL® Packs Together! Bringing kids into the hobby has been a focus for Upper Deck for some time. With the 2015-16 NHL® Rookie Class being one of the most anticipated classes in a decade, Upper Deck believes kids need to be a major focus of the company’s marketing initiatives. Therefore, at the 2015 NHLPA Rookie Showcase, Upper Deck invited in a variety of kids for a focus group to open 2015-16 NHL MVP and give us their thoughts on the cards. As if getting free Upper Deck packs wasn’t enough, the company had a surprise in store for the kids. During each focus group session, the company brought up some of the top rookies from this year’s class to open packs with them. Their reactions were priceless. It was a jaw-dropping, deer-in-headlights moment for them as they got to meet the future stars of the NHL in person. Zach Fucale and Connor Brown gave this young collector quite a thrill. Imagine opening hockey packs with seven top rookies! The rookies were great interacting with the kids! Pretty incredible moment for these young fans and collectors. And all of a sudden, we had brand new collectors for life when Mitch Marner, Dylan Strome and Connor McDavid popped in to open packs with the last group! 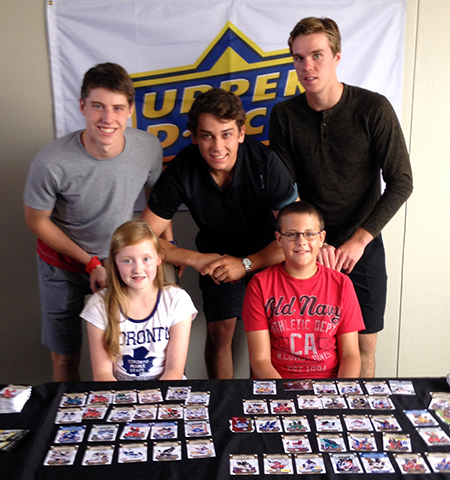 Dylan Strome, Mitch Marner and Connor McDavid had fun with kids as they opened packs together. Safe to say these young fans will never forget the day they met some of the game’s greatest future stars. 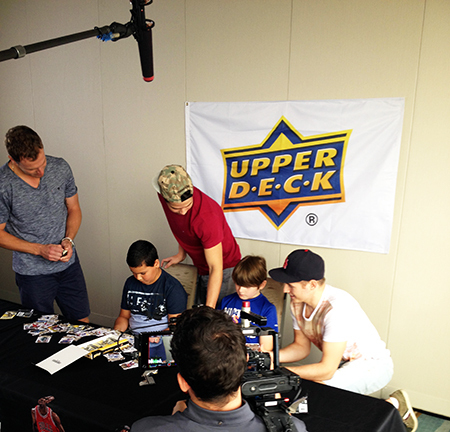 Upper Deck recorded the kids meeting the young stars and their reactions were very cool. Take a look! A huge thank you to Upper Deck and all the NHL rookies for making this possible. Our kids will remember this for the rest of their lives ( as will us parents!!). It was such an amazing experience for everyone. The rookies were class acts, so engaging and so friendly. A truly once I a lifetime experience. THANK YOU for giving these kids the opportunity of a lifetime!! Kelly Minns, proud hockey Mom. Great job by upper deck and Chris Carlin! You guys and the card collectors that donated to my 11 yr olds collection at cards infinity really got my boy into collecting and the i m sure he will be for a long time! Great Company, EXCELLENT product, Chris did a fantastic job setting this up and executing – well done! Great opportunity for the kids. They had a blast. What an amazing event for our kids to be lucky enough to attend. They will never forget these two days. THANK YOU Upper Deck, NHLPA and all the rookies who were there. Seeing the kids faces light up when the rookies walked in is something we parents will treasure forever! The rookies were so engaging and kind to the kids. A truly world class event. A million thanks for letting us be a part of it!!! What you guys could do is actually surprise kids. I mean it’s awesome that the rookies did a little bit of kid time, but the kids are at the NHLPA Rookie Showcase, Of course they will run into a rookie or 2 and 9 out of 10 times the rookie will check out what the kids are doing. Take a rookie into a card shop out of the blue or to a card show and see tons of kids and even grown ups freak out. Sorry my 2 cents, i think the microphone in the pictures made it feel a bit staged. Scott, the microphone and cameras were there because the kids thought they were part of a focus group on hockey cards, they didn’t know there were players at this venue until they walked in the door. We have video we will be sharing in a couple weeks that shows their excitement.